﻿Make sure you claim the special rate when you bring a friend who hasn't previously attended. ​★ Hear & ﻿﻿share tales of ﻿﻿courage ★ Connect with your passion ★ Be the change you want to see. Last full moon, women explored saying no. If you'd like to take your life to the next level in some area and you missed the last event, don't miss the next one! For September, strong courageous women step into creating the deeper balance that enables no ​to happen! "Balance is not better time management, but better boundary management" - Betsy Jacobson. even when we risk disappointing others" - Brené Brown. Do you put other things and people first over your own health and wellbeing? Does your Inner Critic mess you around if you try to do differently? Do you want your boundaries to enable a balanced life? What would beautiful boundaries be for you? and be inspired by your own and others' stories and visions. the fine art of setting boundaries when you need to - so you live the life you want! a new take on what's in the way - and what's possible. new freedom when you have healthy happy boundaries. a sense of the difference this one area could make for you and for others. insights you can take away and apply. ★ ​Be inspired by your own and others' experiences and wisdom. ★ Have a community that knows what you are up for and is a stand for you to claim your full voice and realise your vision. ★ Leave with a renewed appreciation of yourself. ★ Feel invigorated knowing you are not alone. 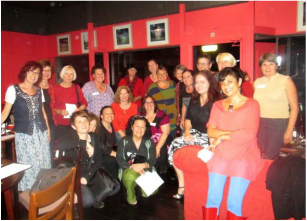 At your back are 30 or so women who deeply share your commitment to equity, social justice and sustainability. ★ Be part of the SOLUTION for this planet. 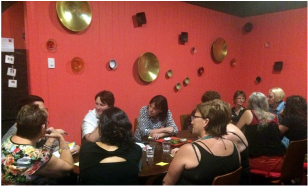 ★ ​The month's special topic or mini workshop, facilitated by skilled and experienced courage catalyst and women's leadership coach Chris Henderson. ★ ​Deep connecting, networking and conversations that matter within a context of trust and empowerment. ★ ​An inspiring, wholehearted community, the like of which is dreamed of yet rarely encountered. ★ ​Appetiser and main dish, with the flexibility to accommodate most dietary needs. ★ A mix of quiet reflection, laughter and celebration - with howls to the moon for those who wish. A donation ​of all profits to the Kapululangu Women's Law and Culture Centre in the remote WA desert. Read more about Chris . . . .
6.00 pm - 9.30 pm, Wednesday 14 September. Union Street Cafe, 106 Union St (corner of Spring St), Spring Hill, Brisbane, Qld. ​NOTE: Additional special offer available if you bring a friend who is attending for the first time. Email chris [@] chrishendersoncoaching.com and provide your name. Chris Henderson is fantastic. Women Howling at the Moon has been an essential part of my journey to starting Consentability. Thanks Chris! - Dr Natasha Alexander, clinical psychologist, founder of Consentability. Great women yummy food - embraced with loving kindness - Thanks Chris for creating this wonderful space. - Victoria Henry, peace activist. This community of inspiring women shares a genuine desire to live life to the full, to make conscious choices about striving towards your vision, and to be present with each other at a deep level through the struggles and the successes. This is my tribe. - Kathryn Walton, Mental Health Social Worker, founder of Condamine Assist. if you're up for being in a space of nurturing, celebration, non judgement, laughter and just awesome amazing inspiring wonderful women then come along. Networking with a difference! - Kristy Holden, bookkeeper and marriage celebrant. I love how much it supports and nourishes each one of us and sends us out strong for another month! - Lani Morris, global trainer, The Map of Meaning. Women Howling at the Moon for me is inspiration, is a beautiful aura ball of generous energy, kindness, support, intelligence and thought provoking ideas available in abundance. Chris facilitates open and honest conversation which has provided me the tools and the courage to move forward in my career which is a most exciting journey. Please join us. We provide smiles, supportive and kind energy for free. - Margot Morton, Airways Health Professional and Trainer. Joining in with other wonderful women at WHatM has helped me come out of my shell. I have become empowered to tell my story/share my passiona and give and receive support. It is amazing how Chris engenders an atmosphere where women can find likeminded souls, to share what's really going on for each toher, and cheer eachother on in our endeavours. I love the sisterly way we get right down to the nitty-gritty in our conversations. - Pam Blamey, freelance art therapist. I love Women Howling at the Moon! Why? Because 1. I get to howl at the moon. 2. I get to talk with very switched on, intelligent, consciously aware women. 3. It is a very welcoming environment. And 4. Women Howling at the Moon are very supportive and help to build other women to success. - Stacey Huish, game changer and visionary, social entrepreneur and 1 Million Women Ambassador. WHATM really addresses the key aspects of human nature that hold us all back, and it does so in an amazingly supportive way - I just love it. - Cherry Wills, Metabolic Balance caoch, Certified Food and Spirit Practitioner and Registered Nutrituional Therapist. Note: Payment is per monthly event and there is no annual subscription. While many women choose to attend every month, freedom and flexibility are honoured as core values. Women are encouraged to attend only where they are drawn to the community and/or the particular theme. * CLICK for all the 2016 Women Howling at the Moon monthly dates. ★ ​Owning your awesomeness AND your weird! Explored through the stories, challenges and learnings of the inspiring community of women who make up the Women Howling at the Moon network. And be prepared for a good dose of hilarity! Register your name at the top of this page to receive updates on future events and any changes. The venue may vary over the year, so do check the automatically updated calendar, or the website or newsletter for details. Or contact Chris directly. Most often the venue is Three Bowls Cafe, 43 Gloucester Street, Highgate Hill, Brisbane. Monthly events are held from 5.50 pm for 6 pm until 9.30 pm.